Well, it's over! The deadline for entry into the Crafting Library KAL has been passed and the threads are closed. There have been some amazing entries into the KAL and I have loved taking part in all the chat over on the Ravelry board. Thank you everyone who joined in, it's been great getting to know you a bit better. In the end there were 24 people who entered three different photographs of progress in the Progress Thread. From those 24 people there were 15 people who gained an extra entry into the prize draw, so in total there were 39 entries to draw from. I used random.org to draw the winners from number 1 to 39, and the prizes were awarded in the order they were released on the blog. Fondant Fibre Bag & Choice of Fibre or Handspun Yarn - NulaBoola. I really hope that those of you that didn't complete your projects, are motivated to keep going and get them finished soon. I certainly plan on finishing my cardigan in the near future. I also hope that you are all motivated to look more often at your crafting library, I know I am. 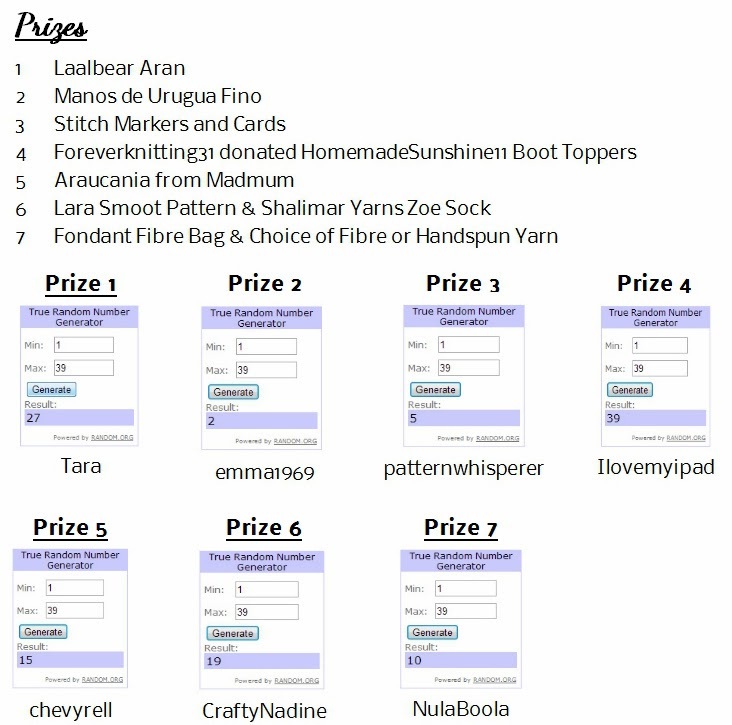 So, if you are a winner, I will PM you on Ravelry and let you know that you are a winner and either ask for your address, or I'll pass your details on to the person sending your prize out. Thank you all for jumping into the KAL so whole heartedly, it's been fun and I hope to run another one in the New Year.